I don't think that anything that I say here is going to actually fully express how much I liked this book. But honestly, I loved it from the moment that I started reading it till I finished. This book made me change the way that I normally read, which is quite an achievement - Normally when I really get into a book I start trying to read as fast as I possibly can (and thus miss bits and get confused later, haha), but with this book I actually slowed down. 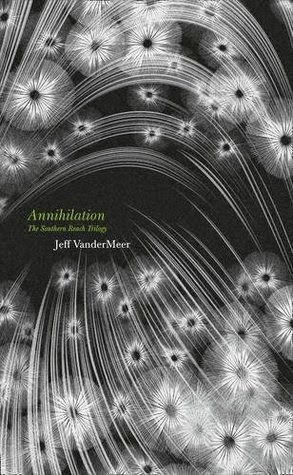 It's not a particularly long novel, and I didn't really want to leave the world that VanderMeer created, it was so creepy, atmospheric, and above all, fascinating. One thing that I really liked about the book was the way that it captured the narrator's voice. The narrator, the biologist (she isn't named in the novel) obviously has a scientific background, and her narrative style reflects that really well. It was sort of detached at times, as if she was stepping back and observing what was happening, which perfectly fit her character. There was a distinct lack of flowery language (always a good thing in my book! ), and I thought that the biologist, and the other characters in the book were all drawn really well, and seemed like real humans who are reacting in very human ways to what happens to them. I think this is an excellent example of how to write a strong female character (for men, women generally don't have issues with this!). The character doesn't have to be some kind of warrior, you just need to give them a personality that isn't purely defined by the fact that they are female, and give them agency. This has nothing to do with the content of the books, but I really like both the UK and US cover art for the whole of the trilogy. They both do an excellent job of conveying the mood of the book. In fact, although I have got all of the novels digitally, I am quite tempted to buy physical copies as well. (Plus, I got Annihilation for free (presumably to entice people to spend money on the rest of the trilogy? It worked for me! ), and I feel that this is wayyyy too low a price for a book that I enjoyed this much! I'm really curious as to where the series will go next. There's still a lot left open and unknown at the end of the first book, and I know that the second one focuses on a completely different thread of the story and completely different characters. I already bought it, so I'm excited about reading it! Although I am also a bit wary that it might let me down. With a book where half the fun is reading about all of the mysterious happenings and trying to figure out what exactly is going on, I think it would be very easy for the explanations (if they do come by the end of the book) to be slightly disappointing. I hope not though. ooh, creepy and unsettling! Just added this one to my goodreads list! I normally wait for a series to be over because I can't stand ending on cliffhangers - but I really, really want to know what is going on with this Area X! I dislike having to wait for the next book after a cliffhanger, but I also don't like potential spoilers that I might come across if I wait until the whole series is out, so I'm always torn between waiting for the whole series to be there before reading, or reading before I can see any spoilers, hehe. Mind you, even if I start reading when the whole series is out it quite often takes me ages to get through the series anyway, so it probably doesn't really matter whether I wait or not!